Last week was the largest Catch a Glimpse party yet!! Thanks so much to everyone that links up every week and for all the newbies out there!! I LOVE seeing all your fabulous ideas! 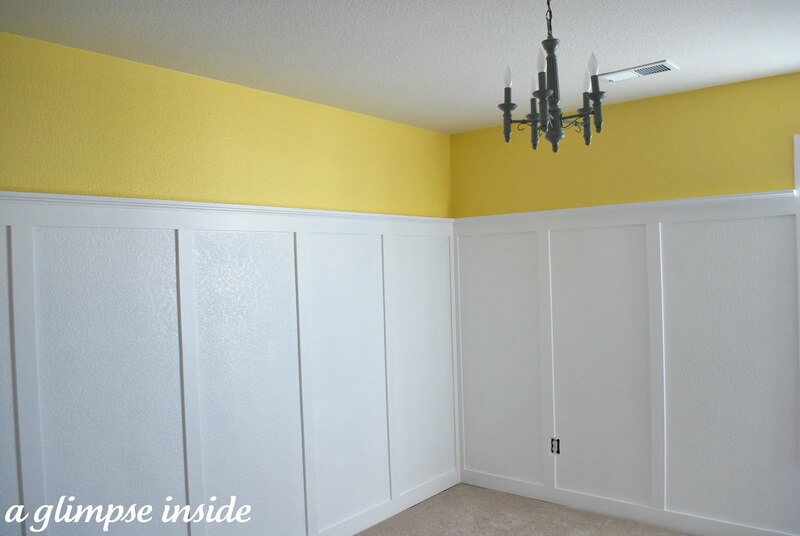 This week, I want to show off the board and batten treatment we did in the nursery. I love how it turned out and I can't wait to add more things to the nursery now. To see how we did the board and batten, check out my Nursery Progress post. So what fabulous ideas do you have to share this week? cuuuuuuute new blog design!! The colors are so cheery and the fonts are great. The welcome! at the top is so great. :) :) I hope you and Baby M are doing well!! I love the high batten board in your nursery...can't wait to see the finished product:-) Thank you for hosting!!! I love the new blog look, and I can't wait to see the rest of your nursery... thanks for hosting! (1) Something to look forward to-SPRING-has inspired my Springy, Silky Scarf Shirt. It's easy to make, fun to wear and looks good on everyone. (2) Free Bachelor Bingo!-make your own bingo card and watch the bachelor with friends and family. It really ups the ante on fun! Thanks for hosting the party once again. Have a great day! The last row of links on the right isn't showing up. One of mine (mini cinnamon rolls) is hiding over there. I just took a look at your nursery post - it's gorgeous! I may have to file that idea away for the future :) I'm a military wife also, so our rental doesn't give us too many options at the moment...but someday! Thanks for hosting! The nursery is coming along great. LOVE the board and batten! Hi Allison! Loving your new digs here...though I like the old colors too : ) Thanks for hosting another great party! Your nursery is coming along so great. I look forward to the final reveal! The nursery is beautiful and sunny. Thanks for hosting this fab party. I am all linked up. Wow, I love what you've done with the place! The colors are perfect and it just looks so nice. Thanks for hosting the party. Help! What do you like? !